Come join us at Ethan Cohen Gallery for our Members Only event! 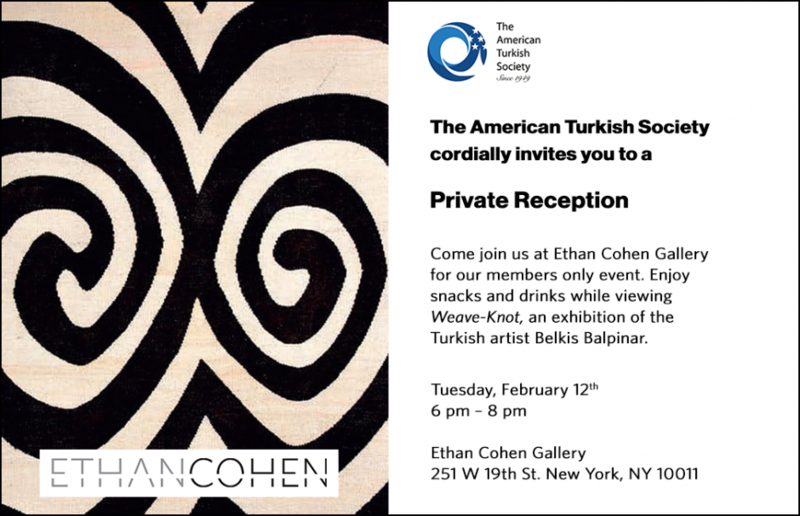 On Tuesday, February 12 The Society organized a “Members Only” event at the Ethan Cohen Gallery in New York. Members of The American Turkish Society enjoyed viewing the current exhibition of “Weave-Knot” by Turkish artist, Belkis Balpinar and learned more about the Gallery and its affiliation with Turkey. Last year, The American Turkish Society was one of the sponsors of Turkey’s leading international art fair, Contemporary Istanbul's Gallery Support Program (GSP). Launched in 2017, GSP subsidizes galleries from around the world to attend the fair and test the Turkish market. In an attempt to encourage galleries in the US to attend the fair, The Society was pleased to support Ethan Cohen Gallery to participate in CI’s 2018 edition that took place between 20-23, September 2018 in Istanbul.